Download: Will simply download this file to your computer. Share: Will bring up the sharing window where you can then share the file with internal and external users, instructions for sharing. Edit: Will open the file to preview where it can then be opened in the desktop app or in the online version of Office (regardless of what your default file opens to). Rename: Will rename the file. Archive/UnArchive: Will archive or unarchive (if archived) the file which hides it from view, while it can't be seen it can be viewed again by changing your settings to view archived content - instructions for this setting and if you wish to unarchive the file simply open the file options and there will be an "unarchive" option in place of the normal archive button. Move: Will bring up a location chooser where you can navigate to another folder to move or copy the file to - instructions for moving and copying. Copy: Will bring up a location chooser where you can navigate to another folder to move or copy the file to - instructions for moving and copying. Save as Template: Will create a template of this file to use and will not be linked to the original file (changes in the original file won't update to the template, the template itself must be updated). 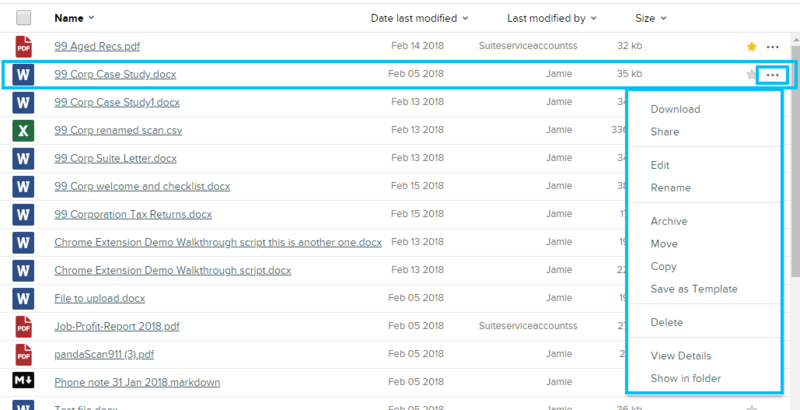 Delete: This option will only be displayed if you are either a SuiteFiles admin or you have permissions assigned to you to delete files. View Details: Will display some general information about the file like it's created and modified date, file size, current folder location and full path. Show in folder: This feature is useful when you're in a tab like Favourites, Recents or Tasks. It will take you to the file's folder location and will also highlight the file in the list. OR select multiple files by clicking the checkbox on where the file type icon is for each file you'd like to select. You can also deselect files by simply clicking the already ticked checkbox. Even when you've selected just one file you will see options appear above the file list where you can click either of the buttons to perform the action on all files selected. When downloading multiple files at once, check in the far right of your URL bar in the browser in case the pop-ups to download are being blocked. If they are simply "select always allow pop-ups from SITENAME..."